Although Tesla stock fell from as high as $390 in September to $300 now, it’s still 100% higher than it was in 2014. The company almost doubled its losses in the three months ending Sept. 30 to $619 million, a record quarterly loss for the electric vehicle manufacturer. The company missed profit expectations, reporting a loss of $2.92 a share on adjusted earnings, compared with Wall Street’s expectations of $2.30. Tesla posted sales of $2.98 billion, beating the expected $2.94 billion. At first glance, it would seem like Tesla is a terrible investment that is on the verge of insolvency, but as I explained in February, there is more than meets the eye here. There is a major misconception that Tesla losses money with each car they make, but that is not: the car business has gross profit margins of 20% (which is 10% higher than Ford and GM), but rather the losses are due to capital expenditures to build the factories in order to meet production goals. Due to insatiable demand, Tesla has a huge backlog; meanwhile, Ford and GM have to advertise incessantly just to make people aware that their cars exist, let alone want to buy them. Many companies are stuck in a much worse situation where they spend so much on marketing that there is no profit left over; Tesla does not have that problem. Ford and GM have weaker profits due to dealers; Tesla bypasses the dealers by selling the cars online and at their official headquarters directly to the buyers. 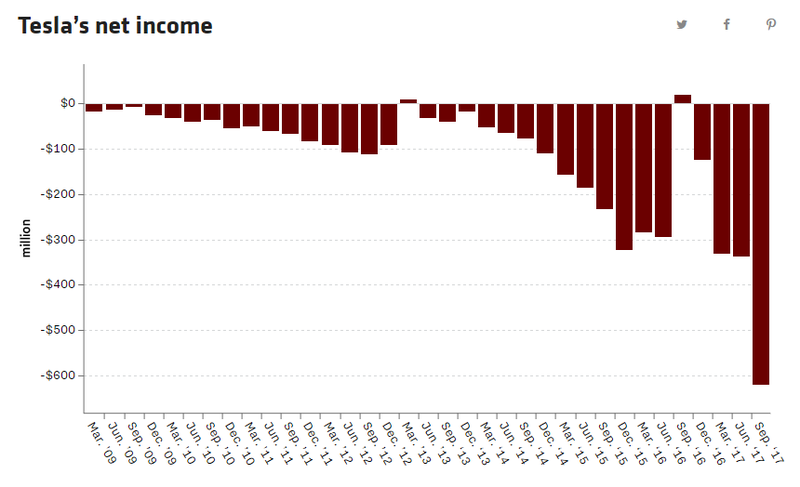 Other companies were cash-flow negative, unlike Tesla which is cash-flow positive. Webvan and Pets.com lost a lot of money and eventually folded because the costs of delivering the food and storing it were too high. Webvan, unlike Tesla, had no possible path to profitability because the business model was fundamentally nonviable. Looking at the balance sheet, in 2016 Tesla spent $1.4 billion on capital expense, such as factories. This is part of Cost of Goods Sold (COGS), which in 2016 totaled $5.4 billion. Tesla spent $2.2 billion on SG&A expenses, such as labor and S&D. SG&A expenses, unlike capital expenditures, tend to be recurring and permanent. Tesla earned $7 billion in 2016. $7 billion minus $5.4 billion minus $2.2 billion gives a net loss of $620 million, which looks pretty bad, but when one subtracts the capex shows a nearly $800 million profit. But also, sales increased from just $410 million in 2012 to $7 billion for 2016, which is just mind-blowing (the average company grows just 5-10% a year). That explains why Wall St. is so optimistic about Tesla despite its spending. 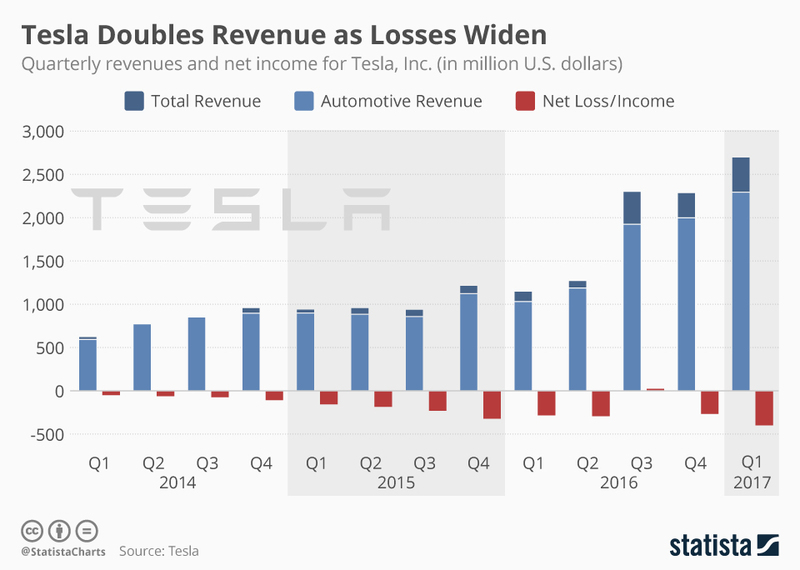 Tesla’s quarterly losses are attributable to increased production of the Model 3 sedan, not because its car business is unprofitable. As soon as the spending stops, Tesla will be profitable. Tesla short-sellers don’t understand that manufacturing businesses are initially very capital intensive. The company said it has a cash balance of $3.5 billion entering the fourth quarter. Tesla expects fourth-quarter capital expenditures to be about $1 billion, driven largely by payments on Model 3 production equipment, spending on Gigafactory 1, and Tesla’s further expansion of stores, service centers, delivery hubs and the Supercharger network. The success of the offering underlined the voracious appetite for a piece of Tesla’s debut corporate bond, despite ructions in the wider market. High-yield bonds suffered their worst two-day losses in nine months leading up to the sale. At 5.3 per cent, Tesla will lock in lower borrowing costs than the majority of other US companies with the same rating, maturity and type of debt, according to Bank of America Merrill Lynch data.